Please note: all measurements must be supplied in millimetres (mm). Use the shutter measure sheet for each room to ensure you have not missed any information or sizes. 1. Measure for depth of reveal clearance (Z frame is recommended for DIY installation if you have the required depth). 52mm depth of frame is required for shutters using both 63mm and 89mm blade with the Z frame. Make sure there are no divider rails or handles that would obstruct the frame. 2. Measure inside width in at least3 places - top, middle & bottom. 3. Measure inside height in at least3 places - left, middle & right. 4. Use the smallest measurements in both width and height. 5. Check for squareness by measuring the diagonals - if the diagonals are more than 10mm different (5mm out of square), an outside mount option would be preferable. 7. If a divider rail is required, measure from the bottom of the opening to the centre of the intended divider rail height. Mark this measurement in the appropriate column on the order form. Face mount L-frame and Deco frame configurations are suitable for face mounting. 1. Measure outside of architrave width in at least3 places - top, middle & bottom. 2. Measure outside of architrave height in at least3 places - left, middle & right. 3. Use the largest measurements in both width and height. 4. Place the width and height measurements in the appropriate columns on the check measure form. The factory will make the frame to the exact measurement given. 5. If a divider rail is required, measure from the bottom of the architrave to the centre of the intended divider rail height. Mark this measurement in the appropriate column on the order form. 5. If a divider rail is required, measure from the outside of where the bottom frame will sit to the centre of the intended divider rail height. Mark this measurement in the appropriate column on the order form. As standard, all panels within an opening will be manufactured at the same width. If the panels need to be made at different widths, uneven post locations can be provided, or if posts are not separating the panels, the individual gap measurements should be provided. The T post location is designated as 'T' and the gap location is designated as ‘G’ in the layout code. This method can be used for hinged or sliding panels, but cannot be used for track bi-fold panels, as all bi-fold panels must be identical in width for the tracking system to operate correctly. It is possible for all width measurements and all height measurements of an opening to be the same or very similar for each direction, and indicate that an opening is relatively square, when in fact the opening is shaped like a parallelogram. For this reason it is crucial that the diagonals of an opening are checked if an inside mount application is to be undertaken. If the diagonals are checked and found to be more than 10mm different, the only inside mount frame recommended to use in this case would be a Z-frame. As it has an in-built architrave, it will be able to hide any unevenness in the opening. 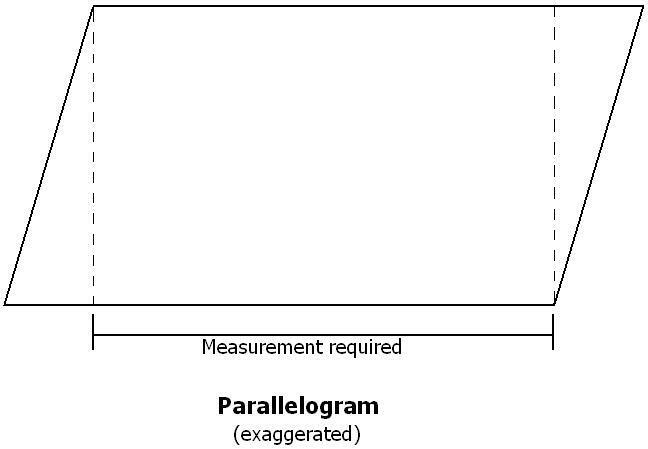 Please see the diagram below for the correct measurement required if the opening is found to be a parallelogram. 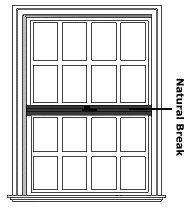 Bay and corner windows are measured in a similar fashion to standard hinged openings. For inside mount, the smallest tight measurement is given for both width and height; and for face mount the sizes given will be the exact size that the factory will make the outside of the frame. If separate frames are required, and will be joined together at time of installation, this is how you would measure each section (for face mount frames you would also need to allow for where the frames would overlap in the corner). If you chose to use a 135° Bay post or a 90° Corner post it is measured slightly differently. A diagram should be sent with your order form for each bay or corner window on the order form. Please note that there are separate diagram forms available for either inside mount or face mount; use the correct form to ensure trouble free ordering. Please feel free to add additional T-posts to these diagrams where required, and be sure to measure the angle where each section meets with a protractor or similar, and note the angle on the form. 1. Measure for depth of reveal clearance. This can be checked with samples of framing and/or a sample panel. Be sure to allow for the louvre to operate past the back of the panel. 3. Measure inside height in at least3 places - left, middle & right for each section of the window, at the position where the front of the frame will sit. 4. Use the smallest measurements in width for each section, and add these together to obtain the overall measurement. Use the smallest height measurement of all of the sections. 5. Check each section for squareness by measuring the diagonals - if the diagonals are more than 10mm different (5mm out of square), an outside mount option would be preferable. 6. Place the width and height measurements in the appropriate columns on the order form. Do not make deductions, as the factory will make these for you. 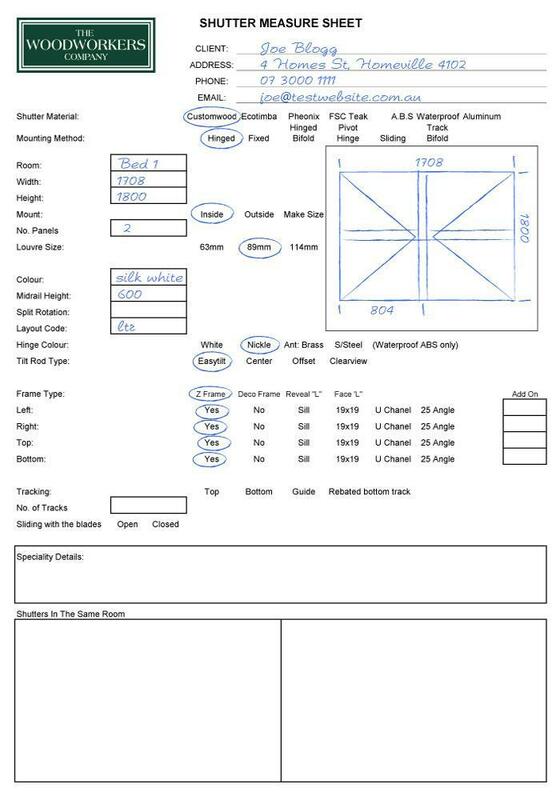 Also mark the individual section width measurements on the order form and the diagram you will send with your order. 2. Measure outside of architrave height in at least3 places - left, middle & right for each section of the window, at the position where the back of the frame will sit. 3. Use the largest measurements in width for the two sides, and the smallest back of frame measurement for the middle section. Add these together to obtain the overall measurement. Use the largest height measurement of all of the sections. 4. Place the width and height measurements in the appropriate columns on the order form. The factory will make the frame to the exact measurements given. Also mark the individual section width measurements on the order form and the diagram you will send with your order. 1. Measure inside width– top & bottom for each section of the window, at the position where the back of the frame will sit, and add at least 38mm on each side that extends past the opening (76mm total) for L-frame applications, or at least 50mm on each side (100mm total) for Deco frame. For example, a bay window would have at least 38mm added to the far left section and to the far right section, but not to the centre section. 2. Measure inside height in at least3 places - left, middle & right for each section of the window, at the position where the back of the frame will sit, and add at least 38mm on each side (76mm total) for L-frame applications, or at least 50mm on each side (100mm total) for Deco frame. 6. Place the width and height measurements in the appropriate columns on the check measure form. Do not make deductions, as the factory will make these for you. 7. If a divider rail is required, measure from the bottom of the opening (usually the floor) to the centre of the intended divider rail height. Mark this measurement in the appropriate column on the order form. Headboards are supplied as standard for all bi-fold openings. Sideboards can be used as an option for face mounting, however it is recommended that all face mount bi-fold applications should use sideboards, as it provides greater light blocking, and also offers more support to the headboard. These instructions allow for the use of sideboards. If sideboards are not being used, do not add 38mm to the width. Please give the overall panel width only. General practice for a face mount bi-fold is to place the headboard and/or sideboards around the outside of the architrave. The measurement required for manufacture is to the outside of the sideboards. 1. Measure outside of architrave width in at least3 places - top, middle & bottom, and add at least 38mm for sideboards (19mm each side). 2. Measure outside of architrave height in at least3 places - left, middle & right, and add at least 19mm for the headboard. 4. Place the width and height measurements in the appropriate columns on the check measure form. The factory will make the outside of the frame to the exact measurement given. 5. If a divider rail is required, measure from the bottom of the opening (usually the floor) to the centre of the intended divider rail height. Mark this measurement in the appropriate column on the order form. 2. Measure inside height in at least3 places - left, middle & right, and add at least 19mm. 1: Measure for depth of reveal clearance. This can also be checked with sample panels. Be sure to allow for the louvres to operate past the back of the panels. 2. Measure inside width in at least 3 places - top, middle & bottom. 3. Measure inside height in at least 3 places - left, middle & right. Headboards are supplied as standard for all sliding openings. Sideboards can be used as an option for face mounting, however it is recommended that all face mount sliding applications use sideboards, as it provides greater light blocking, and also offers more support to the headboard. These instructions allow for the use of sideboards. If sideboards are not being used, do not add 38mm to the width. Please give the overall panel width only. General practice for face mount sliding is to place the headboard and/or sideboards around the outside of the architrave. The measurement required is to the outside of the sideboards. 4. Place the width and height measurements in the appropriate columns on the checkmeasure form. The factory will make the outside of the frame to the exact measurement given. The height measurement provided will employ the same method as used for the instructions above. The width measurement provided should be the overall panel/s width, not including the sideboards and without any overlaps. A diagram should always be provided to clarify this.